BEAUTIFUL BLUE RIDGE, GA CABIN, This picturesque setting is breathtaking. If you are looking for a one of a kind experience then you’ve found it. Ake’s Acre is a beautiful new cabin sitting on an acre of flat ground surrounded by mountains and a meandering creek. This picturesque setting is breathtaking. The screened in back porch has the perfect view of the creek and outdoor space. Sit a while, read a book, take a nap and forget your worries. The property also boasts an outdoor covered pavilion with a fireplace and lots of seating and tables. A hammock by the creek to dream the day away, a regulation horseshoe pit, gas grill, a fire-pit for some s’mores, a hot tub for relaxing after a day of adventure, this property has it all. The inside of the home was perfectly planned for entertaining and relaxation. Walk into the open living, dining, kitchen where everyone will gather. The one of a kind rock fireplace has a large stone fish embedded in the chimney rock work above the half log mantel. The beautiful décor and furnishing’s throughout the home is impeccable. A Chef’s kitchen fully stocked, WiFi and a washer dryer are among many of the amenities of the home. Enjoy all of the modern conveniences of home in a mountain setting. The loft game room has a foosball table, table tennis, puzzles, games, videos, coloring books and a mini shuffleboard. The home is easily accessed by paved roads and is motorcycle friendly. A large fenced area with 3 kennels and a doggie door with a ramp welcomes your fur buddies. Don’t forget your fishing/fly poles for some trout fishing as Fannin County is the Trout Capital of Georgia and the cabin is about 8 min from both Curtis Switch and Horseshoe Bend fishing areas on the Toccoa River. 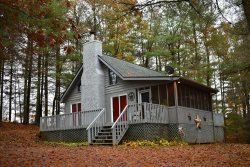 The cabin is where you will want to stay don’t miss out on the many unique activities and outdoor experiences North Georgia has to offer. Meander the streets of Blue Ridge where you will find one of a kind shops and eateries. Take a ride on the Blue Ridge Scenic Railroad, Hike the Appalachian Trail, Visit a waterfall or swinging bridge, Tube, Kayak, Paddle Board or White Water Raft the Toccoa or Ocoee River’s. Step back in time and watch a first run movie at the famous Swan Drive-In Theater or visit Mercier Orchards. The possibilities are endless. The cabin and the property are simply beautiful!! So much to do in such a short amount of time. The decorations are very pretty and the accommodations are perfect!! I was always greeted promptly and very pleasant. The staff is super friendly. My stay was awesome. I would definitely be visiting again. The scenery was everything I could imagine and more. The property was very clean and peaceful. Im already in the process of recommending others. This is a beautiful home. We thoroughly enjoyed our visit. We love the rocking chair porch. The home is comfortable with a beautiful view!! We cant think of anything that could have made our stay any better! My husband and I had a lovely stay at Akes Acre. The party is gorgeous with a tranquil creek in the backyard. The cabin was cozy and comfortable and we were so happy to be able to bring our dogs with us on this trip!